8:50pm after a day where apparently my body is telling me via the medium of a neck that doesn’t want to move around much that I should probably take things easy and not spend most of the day staring at a screen on my lap trying to a) move words around, b) get rid of words, c) put new words in, d) give up and just write new words all over, e) restore the original words, f) look at Twitter, g) realize that one of the words I saw on Twitter was a good one and so on. A face-recognition company now offers a product to help churches track attendance[0, 1]. A major car manufacturer has issued a recall to perform a USB-based software update on 1.4 million vehicles after a zero-day exploit via a wireless telecoms network was shown to rewrite the entertainment unit’s firmware, and from there, to issue commands to the non-entertainment bus to physical components[2, 3]. A US state has sued a private individual for republishing its annotated legal code. One of the world’s largest retailers has turned into one of the world’s largest provider of on-demand computing resource with a retail business on the side[5, 6]. Most commercial websites collect and share data with around 20 other companies to better monetize attention. Software systems automatically identify candidate exoplanets, leading to the discovery of the first Earth-sized planet in a star’s habitable zone. The Gray Lady has explained what a selfie is. People on the internet are regularly creating computer-mediated images for which attributing copyright is more difficult than ever before. 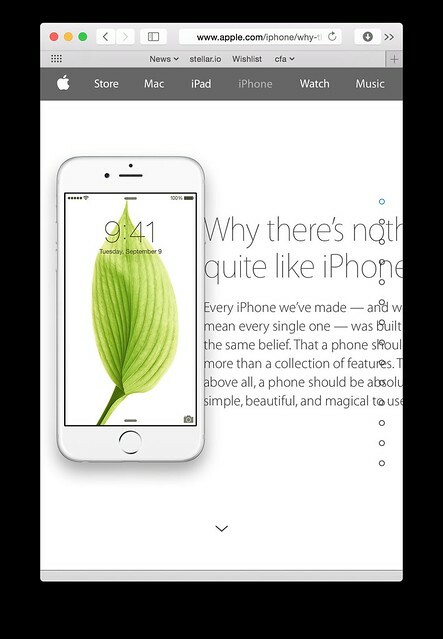 And you get Why there’s nothing quite like iPhone, Apple’s latest online ad campaign about, well, the iPhone. Look, I’ll just get the snark out of the way first before thinking in public about this one. Okay, first: hey, guys! Let’s do a manifesto ad but instead of making a :90, let’s make a website! And: Hey, what if we did a Snowfall but for saying how awesome the iPhone was? I’ll just do those two. I’m sure you can come up with more amongst yourselves. I mean, you could talk about the copywriting for a bit. About how iPhone has “its Focus Pixels and auto stabilization and image signal processor already ready to go.” About how we’re told that there are “capable” apps on the App Store. About bizarrely introducing the phrase and concept of malware, but not being able to say that malware and iPhone *are* strangers, that instead they’re *practically* strangers. I mean, it’s not like the copy is Samsung bad. That would be terrible. And let’s not talk (ok, total lie, we’re talking about it) the weird tone of voice in the calls to action at the end of the experience. Yes, I said experience, because people will totally talk about this as an Experience with a capital E in just the same way that Snowfall was an Experience with a capital Snowfall. No, let’s not talk about “Awesome, I want one” or “So, how do I switch?” let’s just talk about the fact that the buttons are weirdly sized. Ngggggh brand advertising on the interwebs. You know what was good? Shot on iPhone. That was good. This is just masturbatory copy. It’s annoying because it’s not the *worst* manifesto, it’s annoying because it’s a mediocre manifesto. It’s annoying because it’s long where it doesn’t need to be, because it’s Apple experimenting with a tone of voice that it hasn’t really used before that feels more like someone trying to be down with the kids and showing how cool they are by launching a worldwide always on radio station or giving everyone a free copy of the new U2 album. This, I think, is squarely and firmly in the uncanny valley of manifestos. But, you know, we’ve got a new Apple now. Steve’s gone, everyone’s getting to try new things (which is good! Trying new things is good! ), but let’s just say that it’s my humble opinion that by increasing quantity (which demonstrably has happened – Apple is now running campaigns when it doesn’t have anything *new* to say, which means they’re advertising and producing communications outside of relevant product launches or updates) they’ve missed the bar on quality. And what was the brief, anyway? Find a really long-winded way to talk about *everything* that’s in the iPhone and why only the iPhone can be the iPhone? Really, I think they should’ve just made a :90. Meanwhile, my Apple TV feels like it’s getting alzheimer’s and I’m having to reboot it more and more often. Apple – iPhone – Why there’s nothing quite like iPhone. I got a bunch of replies to yesterday’s episode on all that rambling about the web and centralization amongst other thigns. Jim Stogdill wrote skeptically (and persuasively) about how every time we think something might decentralize (his particular example was digital cash), it ends up centralizing anyway. Digital payment systems that wouldn’t have been subject to equivalent processing fees like credit cards are might have helped us move toward a decentralized web and one that didn’t race to an advertising-fuelled bottom, but in the end, all those servers might have just ended up on a different centralized platform – AWS – instead. Oh, I don’t know. I don’t know how we get from here to there. One of the devil-in-the-detail questions is always: yes, well, it would be *nice* to live in a socialist utopia like the Culture or (if you ignore some/most of the more troublesome bits) the United Federation of Planets during one of its peacetime eras, but there does seem to be a remarkable lack of detail in the plan for how you get from here to there, almost as if there are gnomes and underpants involved. Sure, it’s nice to say that the Culture is decentralised because every Ship and Orbital contains everything that’s needed to make the Culture again, but that’s a bit handwavey. Also, it’s fiction, so it doesn’t count. A fictional socialist utopia. It’s 9:20pm on a Friday and I don’t have to go to Washington, DC next week, which is good, because I have other things to do.